!!! 50% of content, broken pump - functional !!! !!! only 60% of the content !!! Reconstructive oil treatment is the first step in-depth regeneration of damaged hair. Muru Muru Butter - This natural extract of the Astrocaryum murumuru palm nourishes, restructures and moisturizes the hair fibre. 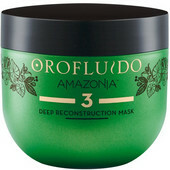 Rich in fatty acids, it smooths the cuticle and adds body and volume. Sacha Inchi Oil - The oil extracted from Plukenetia volubilis seeds contains high levels of essential fatty acids and helps to repair and coat the cuticle for softer, smoother hair that is more resistant to damage. Açaí Berry Extract - The extract of the lush berries from the Euterpe oleracea palm provides an abundance of antioxidants that are essential for achieving healthy- looking, beautiful hair. Keratin - This protein penetrates the hair fibre to reconstruct it from within, adding shine and softness to achieve healthy- looking hair. Apply evenly on dry hair with a brush. Add heat to optimize depth. Leave in for 15 to 25 minutes and rinse thoroughly. 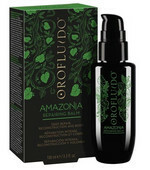 Then apply Step 2 Orofluido Amazonia Oil Rinse.